Red Wheel ∕ Weiser Online Bookstore | Touching the Light Day by Day: 365 Illuminations to Live By by Meg Blackburn Losey, Ph.D.
Meg Losey is a spiritual teacher with her feet planted firmly on the ground. Her teachings help readers �get real,� claim their own power, and use it for the good of their mind, body, and spirit of others. 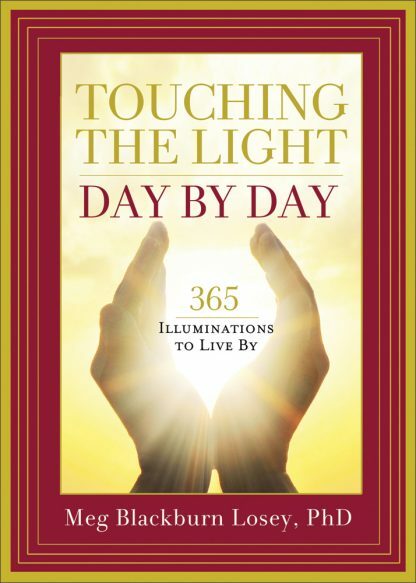 Touching the Light Day by Day offers 365 quotes and brief healing and inspiring meditations. It�s a great book for either beginning or deepening a practice. It�s invaluable for both the novice and the expert to get in touch with their own inner voices and spirit guides. Losey invites us to open our hearts and merge with God Consciousness, something, as she teaches, anyone can do. This little gem of a book is Meg Losey�s gift to her readers. These illuminations come to her each morning. She invites readers to use them as they will�for daily meditation. Or open at random to find a helpful thought. Or use them to invite our own spirit guides into our lives.